They’re a touching twosome. Isaac, a blind Husky, and his companion Isabella, a female Terrier mix, were found roaming the streets of San Bernardino County, California on March 18th. The pair stands out because of their partnership. The Husky is blind, and Isabella acts as his Seeing Eye dog, helping Isaac find his way around and staying by his side. They were scheduled to be put down, but thanks to the power of Facebook, word spread about the dogs and their touching story reached the STAND Foundation, an animal rescue nonprofit based in Los Angeles. The shelter released the pups to the organization, and now the dynamic duo is up for adoption. A fisherman from Canada won’t soon forget this vacation. Fab Marchese, visiting the U.S. from Ontario, hooked what likely was a great white shark in the Gulf of Mexico this month, battling the dangerous but protected species for 3-1/2 hours before letting it go back into the ocean. Captain Maisano initially spotted the shark. Marchese and three other Canadians come south every year to fish, always using a boat from Go Fast Fishing Charters in Treasure Island, Fla. But this trip proved more memorable than usual, with one of the Canadian visitors recording Marchese’s struggles with the great white on video. The shark was estimated to be approximately 18 feet long and 2,500 pounds. It all started when Captain Joe Maisano saw a “big dark spot in the distance,” Marchese told CBC Hamilton. They dropped bait, and the long battle with the shark began. 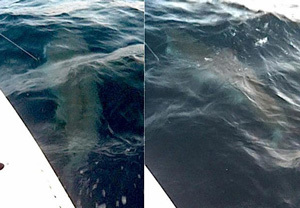 Once they got the shark on the side of the boat, they had to let him go because great whites are protected species. Experts say the shark in the video likely was a great white. “My hands were cramped up and my stomach muscles were sore,” Marchese told CBS Hamilton. An expert from the Mote Marine Laboratory in Florida told Bay News 9 that the shark in the video does appear to be a great white, and that spotting them this time of year is not unusual. Pedestrians in China are furious after city traffic planners built an overpass so low they can barely walk under it. The bridge was built right over an existing pedestrian walkway in the southern city of Nanning. Now, walkers have to bend down to get under the 4-foot-3-inch passageway. “If it was any lower it would be an underpass,” said one protester told Newscom. Others pointed out the potential dangers. “I’ve seen lots of people nearly knock themselves out on it because they’re not used to it,” he added. But town hall officials are unapologetic.